She had a good night and slept very well. After she woke up and our night nurse had briefed me on the night's events, I started Gwendolyn's routine respiratory treatment (Albuterol via nebulizer, chest percussions, Cough Assist, and oral and nasal suction) -- we do at least three of these respiratory treatments every day and sometimes more depending on her respiratory health. Everything was normal until the third set of Cough Assist and suction. Suddenly, her heart rate spiked to 170+ (her usual is 130) and her oxygen saturation began to quickly plummet -- 98, 97, 96, 95, 94, 93, 92, 91, 90%. As the parent of an SMA child, this set of circumstances is terrifying. The look on Gwendolyn's face was horrifying. She was gasping for air and was heading towards complete respiratory distress. Something was blocking her airway. As most of you know, Gwendolyn cannot swallow or cough. We use a suction machine regularly (sometimes as often as every few minutes) to help her with her secretions and a Cough Assist machine to help her cough anything up that needs to be suctioned out. The whole point is to keep her airway and lungs healthy and clear -- it is a constant battle. We refer to the globules of secretions that regularly get lodged in Gwendolyn's airway or lungs as "mucus plugs" and there are varying levels of danger associated with each and every plug. 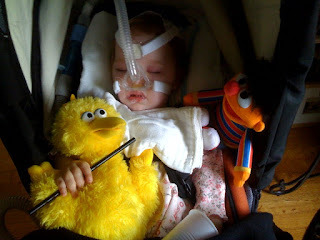 Several times per day we suction mucus plugs out of Gwendolyn -- some are small and easy to manage and some are large or deep or sticky and harder for us to clear from Gwendolyn's airway or lungs. ALL are scary and the horrible part is that we never know when that next mucus plug will be coming or how dangerous it will be. They happen in a split second and we need to act, and act quickly, to get each and every one of them out of Gwendolyn to keep her breathing, to keep her lung from collapsing, to keep her alive. In short, it's torture constantly waiting and watching for the slightest signs of my daughter gasping for air, but it is the second by second, 24/7 reality of this horrible disease. The mucus plug this morning was extremely scary for me. We deal with these situations several times daily, but I haven't seen this extreme look of panic on her face coupled with the set of heart rate/oxygen saturation levels since her right lung collapsed a year ago -- an event that kept us in the hospital for several weeks and a time we really thought we were losing her. There is no way for me to adequately describe the thoughts and emotions that go through my mind in times like these with Gwendolyn. On one hand, as her caretaker, I slip immediately into paramedic mode doing whatever it takes to save Gwendolyn's life and, on the other hand, as the parent of a terminally ill child, thoughts of, "Is this is going to be it?" start running through my head. Luckily, I was able to do a few extra Cough Assist rounds coupled with rigorous and deeper suctioning and whatever was blocking her airway was eventually dislodged. She was still gasping for air, but I could tell that she was doing better and her oxygen saturation was slowly coming back up. Once I put her back on her bi-pap (we need to take bi-pap off to do the Cough Assist) she was much calmer and eventually stabilized over the next several minutes. It seemed like an eternity, but the whole incident probably lasted less than 2 minutes. Gwendolyn was absolutely exhausted, and rightfully so. Gwendolyn is doing better now. We'll be watching her very, very closely and hoping that this was just a one-off stubborn mucus plug and not an early indication of bigger things to come.